Vacuum often: Floors, walls, mattresses, baseboards, furniture ... Get rid of the vacuum bag as soon as you’re done in case you sucked up a bed bug. 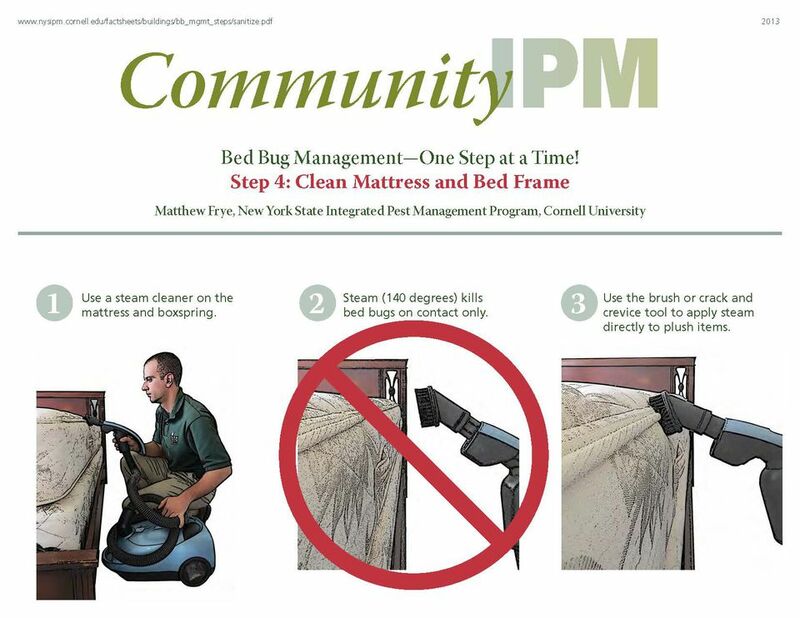 Another resource developed by Cornell/NYSIPM is a Bed Bug Graphics series, which teaches individuals how to inspect, identify, and manage bed bugs using Integrated Pest Management (IPM). Bed Bug Graphics provides a series of step-by-step fact sheets by Matthew Frye with illustration and design by Karen English. 1. Use a steam cleaner on the mattress and box springs. 2. Steam (140 degrees) kills bed bugs on contact only. 3. Use the brush or crack and crevice tool to apply steam directly to plush items. 4. Clean hard surfaces with warm, soapy water and a soft 4-bristle brush. Use orange, lemon or pine-based soaps. That's it – the mattress and bed frame are clean, and a click on "The next step is Heat Treat Everything That’s Safe to Wash" takes the reader to Step 5. All of the documents cited above, as well as more information on bed bugs and their control, are available on the Cornell/NYSIPM website, the sheets can be downloaded as PDFs or viewed as presentation (created with Prezi software). The fact sheets are also being created in Spanish and will be available by year-end.